After three days of collaborative research in the room of the Goethe-Institut Hanoi, the musicians and composers will present for the first time their new creations to the audience. 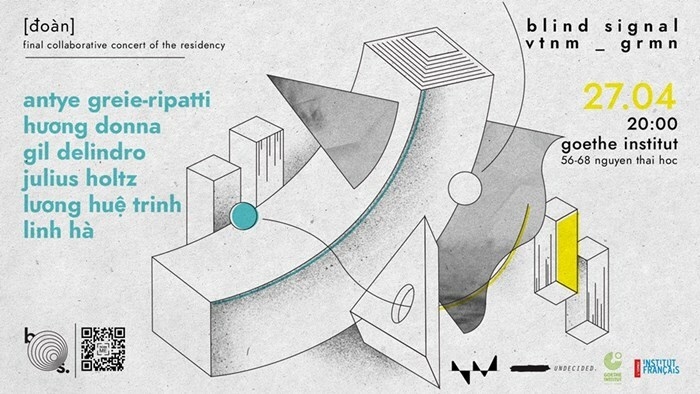 Antye Greie-Ripatti aka AGF aka @Poemproducer, Huong DonNa, Gil Delindro, Julius Holtz, Luong Hue Trinh and Linh Hà LinhHafornow, will be challenged by a week’s collective work creating a common ground all while allowing the exploration of sonic art. Promoting a listening fully stimulate by noise, silence, frequency, transmission and the performativity of media objects, simultaneously remaining sensitive to the complexities and poetics of bodies and identities. The main goal of this project is to offer a bridge linking Berlin-based and Vietnamese sound artists in order to create a mutually beneficial exchange for artist and audience. Offering the participant artists not only the possibility to perform in different contexts, but above all the possibility to collaborate with artists from different backgrounds. We understand that project location has an undeniable impact on creation and this residency will offer sound artists an atypical space where their artistic compositions can reach wider public and creative dimensions, This project aims to develop connections between Vietnam and Germany, hoping that interesting new collaborations might emerge and continue beyond this specific event by producing several live events where international German-based artists can collaborate with Vietnamese artists, giving all the opportunity to create rich new works.